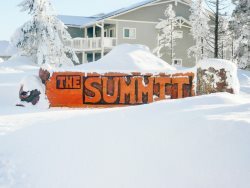 Ski-in/Ski-out, Log Fireplace, WIFI, Large Deck, Sunset Views!! This comfortable 2 bedroom, 2 bath condo is located beside the Powderidge lift and is parking lot level giving you easy access to your vehicle. It has a well equipped kitchen with a log fireplace in the living room. Both bedrooms are upstairs with flat screen TVs. It has a spacious deck with furniture and great views of the slope and mountain sunsets. A great place for Winter and Summer vacations.